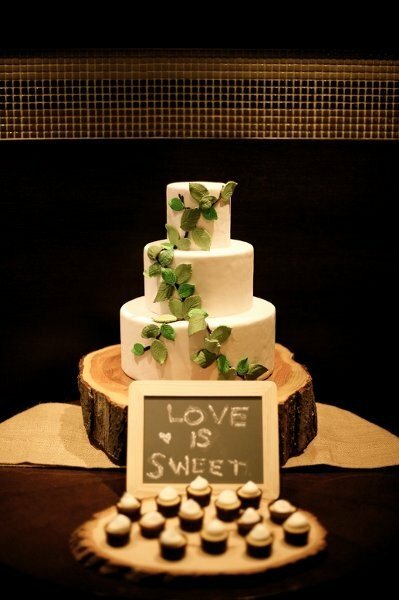 So today seems like a good day to think about a fall-inspired wedding cake. Today’s featured cake is a gorgeous three-tier confection featuring stark white icing accented by green ivy. It’s the ideal end-of-summer kind of wedding cake. And since it’s presented on a slab made from a tree stump it has that autumn vibe too! The addition of cupcakes with the cake are the perfect sweet touch! Cake and cupcakes is a great pairing! You can find this wedding cake here. It was created by The Hudson Cakery.